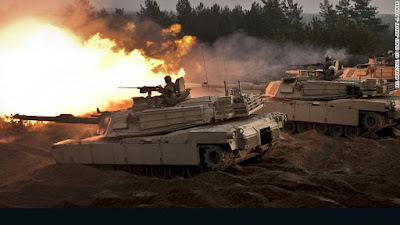 TALLINN, Estonia -- The U.S. military will be sending dozens of tanks, Bradley armored fighting vehicles and self-propelled howitzers to allied countries in the Baltics and Eastern Europe in response to Russian actions in the Ukraine, Defense Secretary Ash Carter said Tuesday. The equipment, enough to arm one combat brigade, will be positioned in Estonia, Lithuania, Latvia, Bulgaria, Romania and Poland, Carter announced at a press conference with U.S. allies in Estonia. Carter said the equipment will be moved around Europe for training and exercises. The U.S. defense chief also said Washington and its NATO allies will be boosting cyber defense efforts. "We must prepare NATO and our allies for cyber challenges, particularly from Russia," Carter said in prepared remarks. Carter's announcement comes during a week-long tour of Europe. "We need to explain to those who doubt the value of our NATO commitments that the security of Europe is vital to everything else we hold dear," Carter said at a press event with his German counterpart Monday. While Carter won't be visiting Russia on this trip, Russian President Vladimir Putin's influence looms over the tour's discussions. "One of [Putin's] stated views is a longing for the past and that's where we have a different perspective on the world and even on Russia's future," he told reporters en route to Germany, in response to a question about whether Putin is a rational actor. "We'd like to see us all moving forward, Europe moving forward, and that does not seem to be his stated perspective." Carter also addressed comments Putin made last week, announcing the addition of 40 intercontinental ballistic missiles to Russia's nuclear arsenal, a move Carter said reflected "posturing" on the Russian leader's part. "Nuclear weapons are not something that should be the subject of loose rhetoric by world leadership," Carter said. "We all understand the gravity of nuclear dangers. We all understand that Russia is a long established nuclear power. There is no need for Vladimir Putin to make that point." Carter's comments are just the latest in an escalating war of words between U.S. and Russian officials. Speaking at the St. Petersburg International Economic Forum on Friday, Putin denied his government is behaving aggressively. "We are not aggressive," Putin said. "We are persistent in pursuing our interests." "The biggest threat on my mind is what's happening with Russia and the activities of Russia," James said during a visit to the Paris Air Show. "It's extremely worrisome on what's going on in the Ukraine." Like what Carter said is planned for the U.S. Army's tanks, U.S. Air Force planes have been rotating through Europe under Operation Atlantic Resolve. Participating in those exercises and rotations have been B-2 and B-52 bombers, F-15Cs and A-10 attack planes. James said the F-22 Raptor, the Pentagon's premier fighter, could join that list. "I could easily see the day -- though I couldn't tell you the day exactly -- when the F-22, for example, rotates in is a possibility. I don't see why that couldn't happen in the future," James said, The Army, too, has been active in these exercises. In March, the Army sent a convoy of armored vehicles on an1,100-mile trek from the Baltics through Poland and the Czech Republic to Germany. Analysts said the size of the armor deployment Carter announced Tuesday was showed it was more symbolic than strategic. During the Cold War, the U.S. had the same amount of armor, a brigade, stationed in just one small part of what was then West Germany, said retired Brig. Gen. Mark Kimmit, the former military assistant to the Supreme Allied Commander in Europe. "We are now talking about taking one brigade combat team and splitting it among these six countries. That should hardly be seen as a threat to Russia," Kimmit said. But the symbolism was important, he said. "We're sending a message of assurance to our NATO allies. We have obligations, under the NATO treaty, to defend those countries if attacked. I think those countries in the region are going to be welcoming the positioning of these - this equipment into their countries," Kimmit said. Orysia Lutsevych, an analyst with the Chatham House think tank in London, said the U.S. and its NATO allies should have been making these kind of statement to Moscow sooner. The Obama administration "should have pushed the Kremlin before reaching to the kind of moment of escalation we are having right now," Lutsevych said. "By trying to appease the Kremlin too long, we will be facing with a higher cost every day."